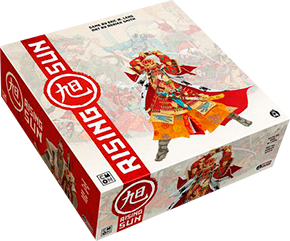 Kickstarter kings CMON continue to churn them out, and Rising Sun is possibly the most spectacular realisation so far of the potential of their newly full-time employees Eric Lang and Adrian Smith. It’s a success on all kinds of levels – game design, artwork, component design – and definitely worth adding to your collection. Of course this being launched via Kickstarter campaign, there may be some things – like the gorgeously tactile ally counters – that retail buyers don’t get to enjoy, which is a shame. But for those that did take the plunge, the quality, and the value, kicks other publishers out of the park. If I was hard pressed to find a criticism, I can only come up with the fact that the board is overly busy and an illustrative element plonked on it is out of place. Game-wise, there is are fascinating number of decisions to be explored with each of your turns, not to mention a whole layer of classic Diplomacy-like backstabbing and deal-making to exploit (or you can choose to ignore that stuff and still enjoy a great game) and an innovative luck-free combat system. And the copius number of miniatures are some of the best CMON have produced. Basically, it’s a triumph, and here’s hoping CMON continue to maintain this level of exceptional quality.